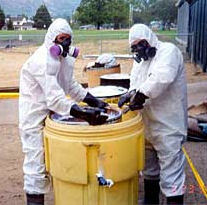 Our goal is to take away the fear of communicating with a hazardous waste company. We are community friendly and have the knowledge and certification to work through any environmental challenge that may be encountered. Whether industrial, commercial or residential, Western States Environmental can handle all of your hazardous waste situations safely, efficiently, economically and, most importantly, officially, with documentation. "It is our goal at Western States Environmental Services to educate our customers and to alleviate the stress of dealing with environmental challenges. We are always learning new ways to handle the issues that arise in our work and we are here to pass on that knowledge and find solutions quickly and efficiently." is a full service environmental contracting firm. We specialize in serving the State of Oregon. Western States Environmental Services, Inc. Copyright © 2003 Western States Environmental Services, Inc. All Rights Reserved.